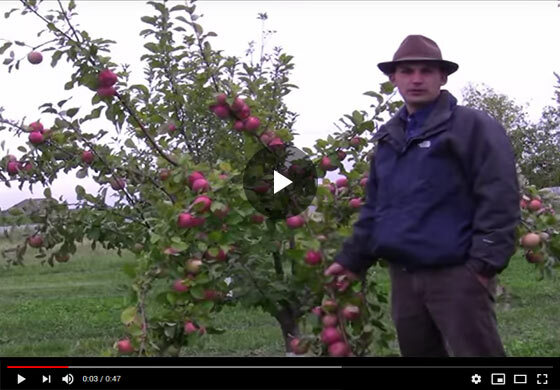 Felix from Gurney's demonstrates what happens when you don't thin your apple tree. Fruit thinning is the process of removing extra fruit from branches to improve the tree's health and vigor. Hi, I'm Felix with Gurney's and today, wanna show you a nice example of what can happen if you don't thin your apple tree. Standing at a Fuji apple, we were doing some thinning trials where we were avoiding thinning this tree. Some the consequences showed up, here's a limb that has a load of fruit on it and it was just too much for this limb to handle and we've got breakage. This is one of the things that can happen if you don't thin your fruit. On a limb like this, you want really only one apple every four inches, single fruits per cluster, that will balance the weight of that fruit on the limb. Here's an example of what can happen if you don't thin your apple tree.